After redlining himself into a hopeless corner of the Mideast live box, Putin let Obama off the hook. Actually, it was more gaffe than hook. Kerry’s lame comment about Syria turning over its chemical stockpiles is the basis for the whole thing. At first he walked back his proposal. 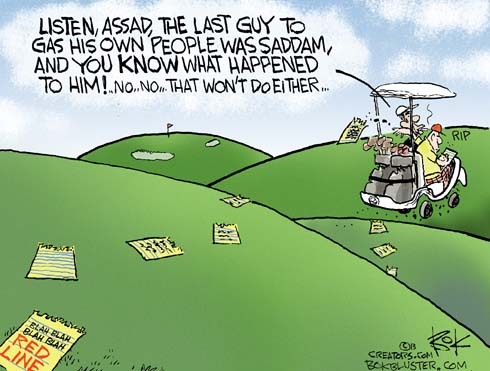 Then Putin snatched it up, Assad agreed, and Kerry walked back the walk back. 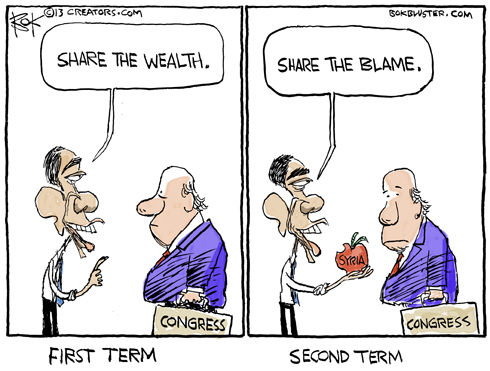 Soon enough Obama took credit for the idea and the party elite swallowed it hook, line, and sinker. Next thing we know President Obama was flip flopping like a fish out of water while giving a speech, trying to convince us to hold off on a war nobody – least of all him – wants. 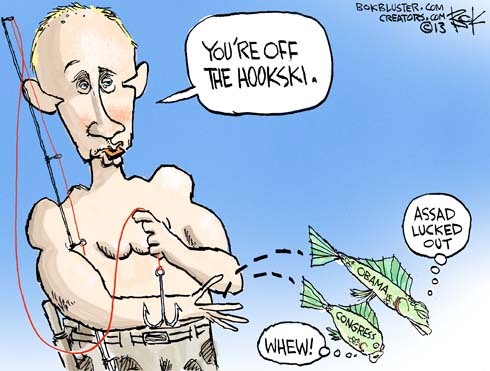 Peggy Noonan imagines Putin wants to negotiate with a president of foreign policy stature (like Nixon) but he’s stuck with “a self-besotted charismatic who can’t tell the difference between showbiz and strategy”. Update: Michael Tackett at Bloomberg covers the whole situation here. 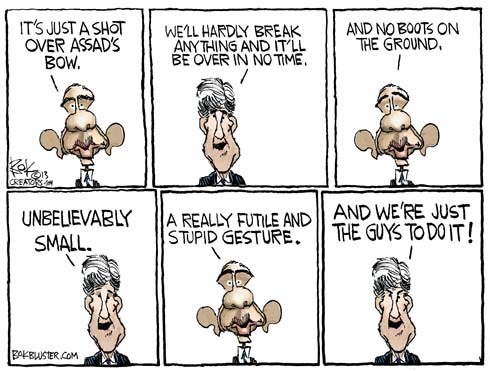 The Obama/Kerry insistence on the insignificance of their proposed attack on Syria reached its logical absurd conclusion yesterday when Kerry described it as “unbelievably small”. What do you do with news that’s already a cartoon? You go to Animal House for “a really futile and stupid gesture”. By six o’clock Obama was all over the news shows swapping his red line for a life line from Putin. Bret Stephens wants to know “when did the American way of war go from shock-and-awe to forewarn-and-irritate?”. What’s with the president’s sudden interest in Congressional approval for “a shot across the bow” in Syria? Until now he’s thumbed his nose at Congress from the Dream Act to Libya. His “lead from behind” intervention in Libya created the chaos that led to the disaster in Benghazi. Andrew McCarthy says there are no moderates in Syria and that the anti-Assad forces are dominated by al Qaeda friendly mujahadeen. All those in favor of killing Assad say Allahu Akbar! Peter Wehner, in Commentary, says Obama “is furious about the box he’s placed himself in”. 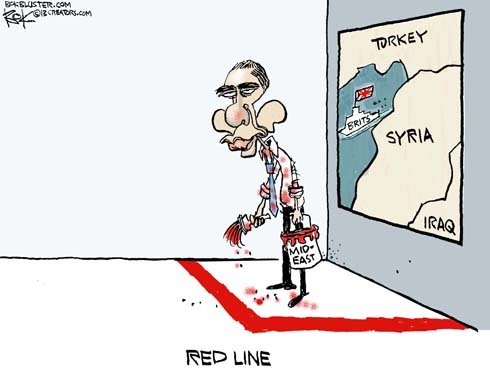 What red line? I didn’t set any red line. While answering a question in Sweden today, President Obama insisted that his credibility isn’t on the line, America’s is. He then proceeded to blame shift outward to “The International Community”. Surely the Solar System bears some responsibility here. Looks like Bush is finally off the hook. Who says that President Obama’s words don’t matter. He warned the president of Syria not to gas his own people. A gas attack meant crossing a red line that would trigger a U.S. response. Apparently we’re down with killing 100,000 Syrians by other means. Anyway, It looks like Assad has jumped the Red Line. Now we have to respond or lose credibility and, according to the polls, the American people have no stomach for another war. Not only that, the British Parliament voted not to help. It’s the first time they’ve denied the Prime Minister a request for military backing since 1782, when Parliament gave up on the American colonies! Maybe Obama should have kept the Churchill bust. So far our leader says he’ll go ahead without the British, UN, or United States Congress. The French are still in. Freedom Fries any one? It looks like Obama’s red line in Syria has been crossed again. UN inspectors are testing victims for poison gas. Putin says if gas was used it was the rebels who did it. The Assad government is supported by Iran and Hezbollah. Al Qaeda looms large among the rebels. So it’s Hezbollah vs. al Qaeda. In a Sunday NYT article titled In Syria, America Loses if Either Side Wins, Edward Luttwak claims the best we can do is hope nobody wins. John Kerry now says a chemical attack is “undeniable”.